During and after the Second World War, it was important to keep up public morale in Britain even during the darkest days of the winter and when the tide of world events was unfavourable to the Allied cause. Dancing and singing were good ways to keep fit and healthy so they were key ways in boosting the morale throughout the country, even over the Christmas / New Year period when daylight hours in the Britain were shortest. Professional dance couples would sometimes do cabaret dances in the style of Fred Astaire and Ginger Rogers, or demonstrate how to 'take your partners' and dance the Foxtrot, Waltz or even one of the what were then newly-imported dance styles, such as the Jitterbug. Among those who gave dancing demonstrations at different dance halls throughout the South of England were 'The Dual Dancers'. The two couples who made up 'The Dual Dancers' were 'The Spencers' (Frank and Peggy Spencer) and 'Laird and Lyons' (Walter Laird and Andé Lyons). The photograph above shows Walter and Andé demonstrating the ballroom technique over the Christmas / New Year period, as there are decorations on the ceiling and in the background. (Unfortunately I do not know the exact date or location the photograph was taken). During WW2 James Bouch had been taken prisoner. While serving with the British Eighth Army in North Africa in Gunner James Bouch was among the 7457 officers and men reported missing during two months of Operation 'Crusader', which began on 18 November 1941. In these circumstances, the family of someone posted missing did not initially know what had happened to their loved one. While they would hope for the best, in many cases they could expect the worst. In the case of James Bouch from Whitehaven, Cumberland the news eventually received back home was comparatively good. Gunner James Bouch had been taken prisoner by German troops. He was to spend the best part of the next two years as a POW in Italy. Fortunately, James Bouch's story was one of those with a happy ending as he made it back home in 1944. A few years later, on 12 May 1951, James Bouch married Eva Wren at the Anglican Church of St Bridget's, Beckermet, Cumberland (now Cumbria). They would eventually settle with their family in the Littlehampton area of Southern England. I would like to thank you Joseph for single handedly keeping this site alive as far as posts go. I still look in here every day and I plan to follow your example and post articles of interest to my locality. Distington village war memorial, Cumbria commemorates 53 people from the district who died in WW1 and 21 from WW2 [Photograph No. 1]. The village is situated close to the main road between Workington and Whitehaven. Its memorial was first erected after the First World War. The names of the 'Fallen' from WW1 are listed on three sides of the obelisk [Photograph No. 2] and the WW2 names are listed on the fourth side of the obelisk [Photograph No. 3]. After the Second World War, the names of the 'Fallen' from the district who lost their lives in the 1939 – 1945 war were added to the memorial. Among the 21 WW2 names listed on the monument is that of Guardsman Stephen Scott M.M, who died in Italy 12 July 1944. It was due to an enquiry about Guardsman Scott MM that I photographed the monument. “Salute the Glorious Dead who went out and returned not”. Leading Aircraftman Alfred Higgin, Royal Air Force Volunteer Reserve, lost his life as the result of an accident on Tuesday 28 August 1945, when he was 28 years old. He was the son of Mrs Margaret Higgin and the late Mr Thomas Higgin of Moor Row, Cumberland, and the husband of Mrs Mona Lister Higgin (née Gillbanks) of Ennerdale Road, Cleator Moor. Alfred Higgin is remembered in the Cleator Moor Roll of Honour and on War Memorial in his home village of Moor Row, a village about 2 miles from Cleator Moor. Sergeant George Graham Gillbanks, Border Regiment, Service Number 3599598, was serving with the 7th Battalion The Border Regiment on Home Service when he lost his life as the result of a training accident on 6 November 1941. Sergeant Gillbanks, who was 22 years old when he died, was the son of Myles Gillbanks and Margaret Gillbanks of Ennerdale Road, Cleator Moor, Cumberland. Before the war, George Gillbanks had been a Sunday School teacher and organ blower at Cleator Moor Presbyterian Church, which was also based on Ennerdale Road. The funeral service for Sergeant Gillbanks was held at Cleator Moor Presbyterian Church, followed by interment at St John's Anglican Churchyard, Cleator Moor. In 1945, Sergeant Gillbanks' brother-in-law Leading Aircraftman Alfred Higgin lost his life in an acident and was laid to rest in the same grave. After the war, along with Captain William Walker, Sergeant George Gillbanks was one of two members of the Cleator Moor Presbyterian Church commemorated on a Memorial Plaque installed at the now-closed church. It can now be found at the town's Methodist Church. It commemorates Sgt George Gillbanks and Capt William Walker. In November 2008 the WW2 Memorial that used to be displayed in the former Cleator Moor Presbyterian Church was donated to Cleator Moor Methodist Church. It will be displayed anew on a wall inside the church alongside other War Memorials from the Cleator Moor Free Churches: the WW1 Memorials of the Presbyterians, Primitive Methodists and Wesleyans. The Presbyterian Church WW2 Memorial was donated to the Methodist Church on behalf of Mrs Mary Hodgson, brother of Sergeant George G. Gillbanks one of those commemorated on the memorial plaque. The plaque had been given to Mrs Hodgson for safekeeping when the Presbyterian Church closed down some years previously. It was originally paid for by Alderman and Mrs James Walker J.P., parents of Captain William Walker. Captain Walker is remembered on the plaque together with Sergeant Gillbanks. When H.M.S. Hood was sunk in battle by the German battleship Bismarck on 24 May 1941 more than 1500 lives were lost. The Hood had engaged the Bismarck in battle, and went down after it exploded following several hits by shells from the Bismarck. There was little time for the crew to escape and only three survivors were picked up. One of those lost on the Hood was West Cumbrian seaman William Nelson, Stoker 2nd Class, P/KX 116642, who is remembered on the Cleator Moor Roll of Honour and the Portsmouth Naval Memorial (Panel 56, Column 2). The Portsmouth Memorial remembers those Naval personnel lost in the two World Wars who have no known grave. In 1941 Stoker William Nelson's parents were living in Frizington (about 4 miles from Cleator Moor) and so his name is also listed among the Second World War casualties on the Frizington Village War Memorial. The 'Hood' was sunk by the Bismarck on 24 May 1941. The Bismarck was sunk by British Naval forces a few days later, on 28 May 1941. In May 1941 the German Chancellor Adolph Hitler visited his newest and strongest battleship, the Bismarck. It was the most heavily armoured ship then afloat, and mounted eight 15-inch guns. Hitler told the crew, "You are the pride of the Navy". Before the month was out, the Bismarck would sink H.M.S. Hood (seen in the photograph above), the Flagship of the Royal Navy’s Atlantic Fleet. The Bismarck itself was lost in battle a few days later, following a concentrated attack by the British Navy, and especially aeroplanes from the Aircraft Carrier Ark Royal. Catherine Williamson, WRNS, HMS Ferret, WW2 was one of those remembered. The Cleator Moor Roll of Honour lists the names of townsfolk who have given their lives in the service of their country. Each November there is a Remembrance Sunday service in the town followed by a march to the town's war memorial where poppy wreaths are laid by civic leaders and others such as the local Cadet Forces (Sea Cadets, Army Cadets, Air Force Cadets) and relatives of those who had lost their lives in the World Wars. On Remembrance Sunday 11 November 2007 the parade to the War Memorial was led by Mr Arthur Baxter, at the time Chairman of Cleator Moor Town Council, and Mrs Anne Faichney, Mayor of Copeland Borough Council (the local council area in which Cleator Moor lies). The above photograph shows the civic leaders, clergy and townsfolk lining up outside Cleator Moor Methodist Church for the parade to the War Memorial. There are two women from the area listed on the Cleator Moor Roll of Honour, both of whom lost their lives during the Second World War. 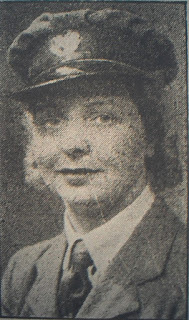 One of these was Supply Assistant Catherine ('Cathy') Williamson who died on 3 January 1944 while serving with HMS Ferret in the Women's Royal Naval Service. The name Thomas Connor is listed twice on the Second World War Roll of Honour for the West Cumbrian town of Cleator Moor. There is yet another Thomas Connor listed among the Fallen of Cleator Moor from the First World War. Whether there is a family connection between these three servicemen linked to the same town for the present I do not know what they are. St Mary's R.C. Church, Cleator, Cumbria. Michael Toman, originally from Bowthorn in the West Cumbrian town of Cleator Moor, played for the Preston North End before the Second World War. During the war, Michael served with the 1st Battalion King's (Liverpool) Regiment in the Far East. Private Michael Toman, Service No 14274879, was one of those who gave his life in the war. He lost his life on 13 July 1944 and is commemorated on the Rangoon Memorial, Burma (Myanmar). Michael Toman is one of more than 100 men and women remembered on the Roll of Honour in his hometown of Cleator Moor, Cumbria. In addition, the Cleator Moor Roll of Honour records more than 250 casualties of the Great War (1914 - 1919). There are two members of the Toman family listed among the Fallen of the First World War. They may be related to Michael as they came from the same district of Cleator Moor. Private John Toman, Service No 3097, 5th Battalion Northumberland Fusiliers, died 26 May 1915 age 20. (Top): LACW Mrs Ella E. Eldon, W.A.A.F. Catherine's pretty wedding dress was made from a German parachute! On 17 February 1943 Private James ('Jim') Toole, Border Regiment, of Frizington Road, Frizington married Miss Catherine Hazard of Hilden Road, Cleator at St Mary's R.C. Church, Cleator. The Parish Priest of St Mary's, Cleator, Father Frederick Cuthbert Clayton O.S.B., conducted the wedding ceremony. Jim Toole was the son of Francis Toole and Jane Toole (née Huddart). Catherine Hazard was the daughter of John Hazard and Margaret Hazard (née Devitt). The Best Man was John Toole and the Chief Bridesmaid was Philomena Hazard. With wartime shortages of material many wartime brides found it difficult to have a white wedding dress made for their big day. Catherine's wedding dress was made from the remnants of a German parachute recovered from a pilot whose plane had been shot down in the Battle of Britain. 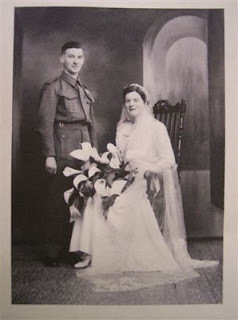 Jim wore his army uniform to get married in, as most servicemen tended to do during the war. It is also a poignant photograph. Jim Toole took part in the Normandy Landings, being among the first troops to land on the Beaches on D-Day 6 June 1944. Later that year, on 30 October, Jim lost his life in the Netherlands when he was shot by a sniper. Glamour and enjoyment in one photograph! In the dark, grim days of the war with thousands of young men and women stationed overseas or in camp sites and gun sites on the Home Front many miles from home, family and friends, music and dancing in the British dance halls provided much-needed glamour and enjoyment. At that time, during the Second World War, there were many dance halls throughout Britain where people could meet up and enjoy themselves in a friendly atmosphere. Generally speaking, many of the British ballrooms of this era had been developed upon good surroundings and decor and encouraging good appearance and manners among the dancers. Among those who helped promote dancing during the war years and the immediate post-war years were the 'Dual Dancers': Frank Spencer, Peggy Spencer, Walter Laird, Andé Lyons, seen in the above photograph. This photograph was taken at the end of a cabaret dance demonstration in a dance hall, and it clearly demonstrates the enjoyment and glamour of the dance hall that all dancers could have on the ballroom. Ballroom dancers Walter Laird and Andé Lyons helped get the nation dancing during and after WW2. During and after the Second World War Walter Laird and Andé Lyons went to many dance halls throughout the country demonstrating how to dance Ballroom and Latin American dancing. They became known as ‘Laird and Lyons’. I think this particular photograph was taken during a dress rehearsal for an evening performance. Walter Laird and Andé Lyons were also one half of the cabaret act known as the ‘Dual Dancers’ along with their good friends Frank Spencer and Peggy Spencer. They also demonstrated the correct dance steps for the audience during the BBC ‘Dancing Club’ broadcasts, begun on BBC radio in 1941, enabling beginners and novices to learn to dance and join in the fun on the dance floor. Dancing and music were popular recreations during and after WW2. Watching elegant couples such as the ‘Dual Dancers’ also gave audiences the opportunity to have a little glamour in their lives, if only for a short time. Whether there any moving film of Laird and Lyons dancing still exist I am unsure. Much of the film used in the early BBC television programmes from the early post-war years was not of the type that could be easily stored.